US Mobile is all about freedom. We focus on transparency and affordability and are always on the lookout for ways to help you save – because the truth is, you shouldn’t be paying an arm and a leg for your phone bill. Likewise, your smartphone shouldn’t be guzzling data. We want our customers to get the most out of our data plans, so we’re sharing some of our best tips and tricks to save data. A surefire way to limit your data usage is by manually controlling Cellular connectivity. It’s useful to know which apps consume data and whether or not those apps need access to cellular data. 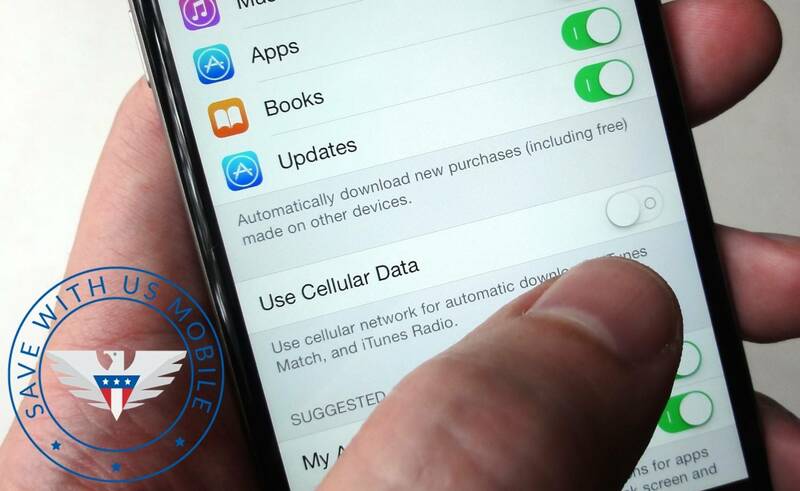 We recommend turning off cellular data for all apps that you don’t need regular updates from. Once you do that, the apps will only update and use data when you’re connected to Wi-Fi. Extend your data plan? There’s an app for that! Data compression apps work by connecting to a third party server that compresses the data and then delivers it to your phone. Opera Max and Onavo Extend are two of our favorites. While video and image quality may be reduced, data heavy social media apps like Instagram and Facebook will greatly benefit from the compression. And don’t worry, none of these services touch encrypted data, which means that your online banking and encrypted email connection are safe – they just won’t be compressed. Popular audio streaming apps such as Spotify and Apple Music offer ways to listen without having to stream over a network connection. Make sure to download podcasts and playlists ahead of time to save data. Facebook automatically plays videos in your newsfeed, which means that your phone’s data is being used to download these videos whether you want to watch them or not. Disable autoplay videos in the Facebook app to avoid unintentionally downloads and save data. Apps often update in the background when you are not using them and this of course uses data. Disabling this feature is a super simple way to save data without affecting how you interact with your phone. By the way we have a few hacks to help you save battery life too!